Dinlos and Skilldos: Letting the puppet strings show. Letting the puppet strings show. "Why did you draw it like that?" you ask. Well, regardless of whether you ask that or not it's the question I'll try to answer in this post. Obviously I draw in a number of styles so the one I chose for 300 pages of Don Quixote was for a specific reason. The reason I did it this way is because it's quicker and I need to do 6 pages a week to pay the bills. A phrase you'll hear a lot when people discuss the styles of comic artists is "Raw or Cooked", it's self explanatory really - Raw is unpolished, as it comes and Cooked is polished to 'perfection'. The traditional process for making comics has helped create these schisms. Most comic artists to this day still work in pencil stage and ink stage and the distinctive comic art look, so shakily mimicked by Roy Lichtenstein, is a result of the process. It was necessary for a hard black line in early comics due to the poor quality printing and so the art of 'inking' was born. 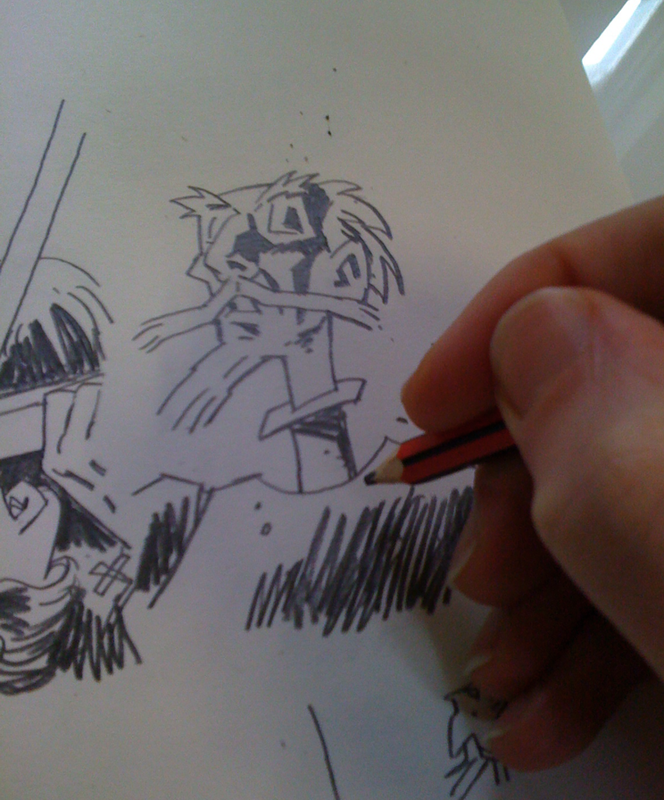 As was the job of 'inker', something that is still entrenched in American comics. Despite the process driving the artist naturally towards the 'cooked', some inking let the brushwork say more about energy and texture than simple tracing. Better printing techniques gave artists even more opportunity to move over to the 'raw' side of the spectrum. Now we have comic art that's stretched the spectrum as far as it can go, just look at a book by Joann Sfar next to one by Chris Ware. I use these two as examples because they are both successful storytellers, there are examples of both approaches where the style, regardless of how wonderful it looks, detracts from the story. Neither approach is guaranteed to tell the story better than the other, but it's important that telling the story is the intention in choosing an approach. No prizes for guessing which side of the raw or cooked spectrum my Don Quixote work sits. 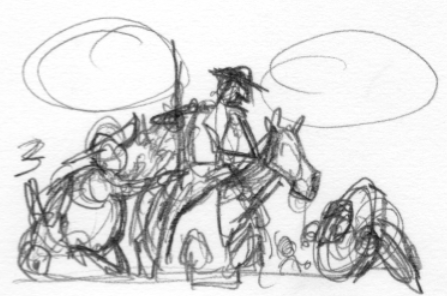 I imagine most artists' roughs look a bit like this, I want to retain some of the that manic energy in the final art. The final line work is still very rough, but hopefully it masks some degree of sophistication. I knew from the start that I would be looking for something ragged enough to reflect the setting, the characters and state of Don Quixote's mind. And coming back to the unclever reason, I did need to make the haste with which I'd be turning the book around work for me rather than against me. I dispensed with ink altogether and decided to scan my pencils. That hasty, raw, pencil work was perfectly suited to the story, but as with all art there was a deception at its heart - there's no way I could put together whole pages of characters interacting in one continuous mad scribble, there is a lot of penciling just as with any comic art. To prevent me from tightening up and polishing the line work unintentionally I draw onto a lightbox set up in such a way as to ensure I can't see the roughs too clearly, this means I'm never tracing, I'm looking to make definitive, if occasionally clumsy, marks. 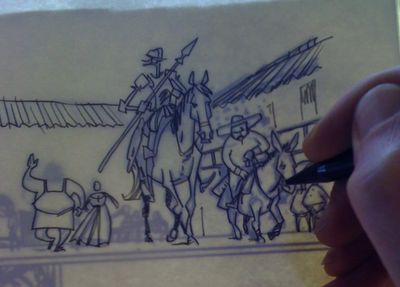 Sometimes I'll switch to a stubby B pencil and work away from the lightbox to introduce shadows and texture. I imagine it's obvious why the ragged look suits a rustic setting and characters, it may not be quite so obvious why that look reflects the state of Quixote's mind. Exposing the workings in a drawing has a long history in the 'fine arts', I still bear the scars of being taught by products of the Slade School where the process of building an observational painting is left on the surface for the viewer to see (the famous measuring ticks and crosses*). This amounts to the artist showing us the puppet strings, it is telling us that it is a painting whilst another part of our brain is shouting that it's a person. That schism was explored in art long before the meticulous Slade painters arrived and in literature it was being explored over 400 years ago by Cervantes in the pages of Don Quixote. Here the design is resolved digitally. 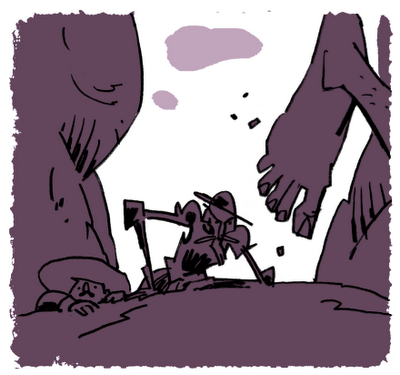 It's about using negative shapes, so I'm roughing in colour. I do this a lot on Quixote. 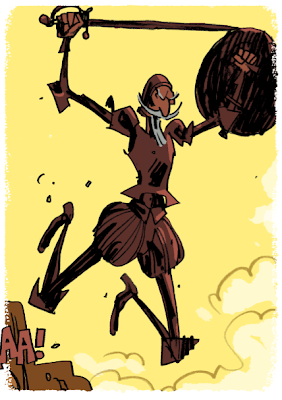 Don Quixote often becomes a squiggle, a kind of signature when he's in the background of a panel. Here's the final art of that panel with the quick lines and fixed design working together. How can we believe in a character from the pages of a book? How can we believe in a person who is just lines on a piece of paper? Cervantes knew this madness and pulled countless readers into it. 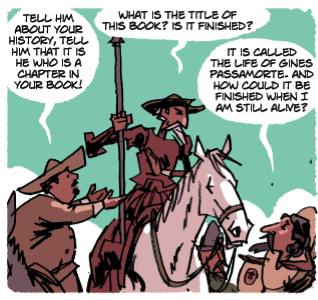 It isn't really possible to adapt Don Quixote, it's an adaptation from a translation of a history of someone who is made up, all we can do as readers is join Cervantes inside this madness. And that's all I can do as writer and artist. *See painters like Coldstream or Uglow for examples of this. I dream of 6 pages a week. Excellent. And thanks too, great post. Wonderful post really interesting just out of interest how far are you into it now? I'll finish it in about 6 weeks time, James. Fab post - beautiful work and a great read. Really enjoyed reading that. Fascinating! Yeah - great post. More of this sort of thing, Rob! When can I put a copy of this on my shelf? It looks like a beautiful version of my favorite story. The book is out in September. Can't wait to get my copy, looks ace! You've done a very nice "job" by the looks of it. See you in Bristol signor! Puppet show is perfect for family entertainment. people enjoy a lot these puppet shows.